What Comes to Mind When You Look at this Picture? I think I know what came to your mind, but it is NOT what you thought! This was taken when I was running along Juhu Beach in Mumbai India. This is a common scene in India and much of the world. It is two men walking with arms around each other’s shoulder. You often see men holding hands — the same with women, both young and old. Are these two men homosexuals? That is what first comes to the American mind. That is because our country and the Western World is messed up. These men are not homosexual and that idea would stun or disgust them. 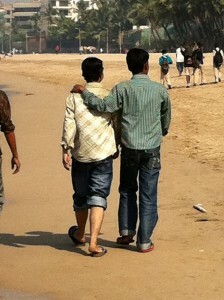 These men are friends and it is common among male friends to show affection. For women it is the same. This culture here in India — and the Arab world and many other countries — is MUCH more healthy than that of America and the skewed Western World. In the West men are afraid to be friends with other men. We are afraid to show affection, to touch or get too close lest we be considered gay. How sick is that? Before the homosexual agenda forced its perversion into our lives, men were not afraid to be friends or show affection with other men (or women with women). This immoral behavior and movement has hurt relationships, friendships and the way we think of each other. Frankly I despise the homosexual agenda, not only because of the perversion and aberration it is, but because it is forced on us and has tainted and ruined many good things in our culture. It has pervaded our country like a cancer. One thing destroyed was a good word — GAY — which used to mean “happy and carefree” but now means a perverted and ungodly lifestyle being pushed down our throats. Check out these passages of Scripture. Just hover your cursor over the references — Lev. 18:22; 20:13; Rom. 1:26–27; 1 Cor. 6:9; 1 Tim. 1:10). I was asked to warn that there might be some rough crude language but in the text it is *****’ed out.